Stephan Lake Lodge, considered the last stronghold for remote fishing in Alaska, offers anglers the opportunity to explore fly fishing in its purest form. If fly fishing is your art and your passion, you’ve come to the right place. If fly fishing is your budding curiosity, you won’t ever want to go back. 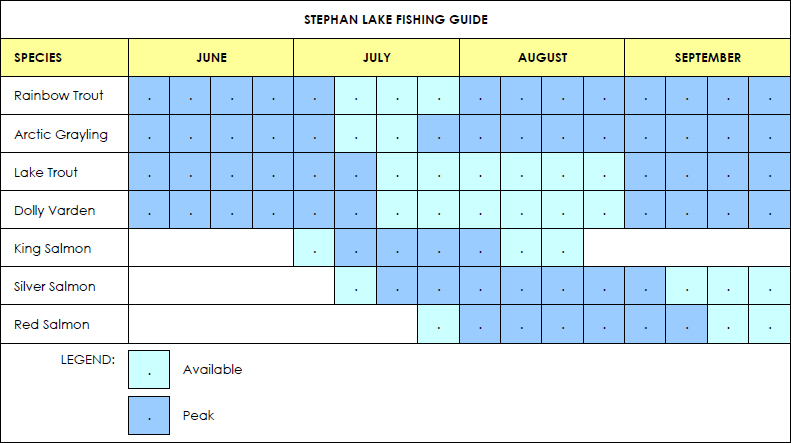 Nestled deep in the spectacular Talkeetna Mountains, 5-mile long Stephan Lake offers ample opportunity to fish idyllic waters throughout the summer. In early June, anglers cast for Rainbow and Lake Trout, Dolly Varden, and Artic Grayling. By July, Chinook (King) and Sockeye (Red) Salmon are plentiful. With the arrival of August, anglers are casting for the coveted Coho (Silver) Salmon. In order to ensure each angler a truly unique, wilderness experience, Stephan Lake Lodge limits the number of fishing guests per week, but our guests are not limited to lake fishing; nearby clear water streams and tributaries offer additional remote fishing opportunities for those craving even more solitude and exploration. CONTACT US to discuss a fly fishing vacation, tied and tapered, just for you.